It’s January, which, in the promotional products industry, means it’s officially tradeshow season. Our team was in Orlando this week getting a jump on the year’s hottest trends at The ASI Show. Next week, we’re off to Las Vegas to attend the promo industry’s premier event, The PPAI Expo. So what does this mean to you, dear business owner or marketer? It means that there are some seriously exciting things in store for you this year. If you want never-before-seen promos to give your marketing a jolt and cement your brand in the minds of your customers, we can help you do that. Your ePromos rep is out there covering miles and miles of tradeshow floor, personally investigating the promotional products that have just hit the market. We’re scoping out the coolest, most innovative products – and we’re doing it all for you. Is there something in particular you’re looking for? Let us know. You can see our top picks by following us on Twitter, and while you’re at it, be sure you’re following our Pinterest boards, too. Everybody’s talking about essential oils. If your customers aren’t already using them, they’re probably curious about all the hype. 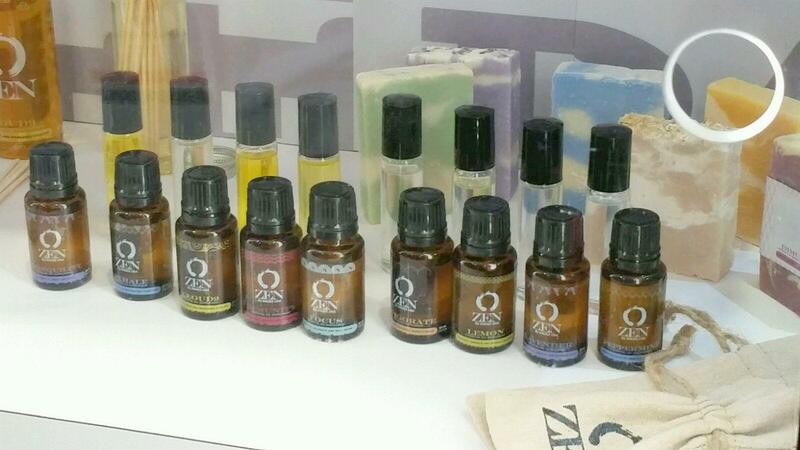 Give them custom essential oils and position your brand as one that’s committed to health and wellness. They’re great for spas, massage therapists, or for any health-related campaign. Can we get an aww? 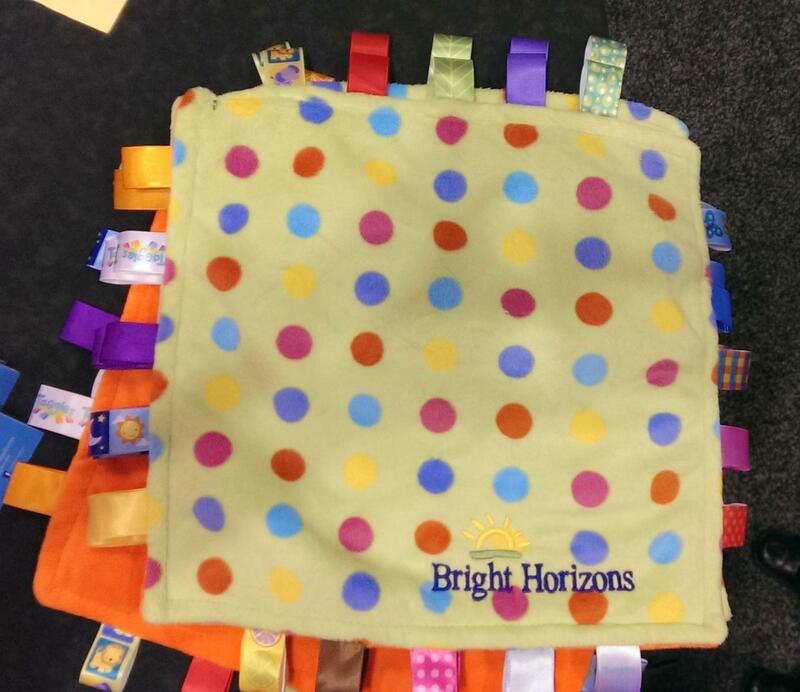 These vibrant blankets promote your brand and baby’s development of fine motor skills. They’re designed with textured, engaging tags around the border and your logo front and center. These super-soft blankets are perfect for hospitals, birthing centers, doulas, daycare centers, and the like. Parents will love you if you give them this blanket. 3. The coolest, cutest clocks. If you’re looking for the trendiest timepieces around, we found them for you. 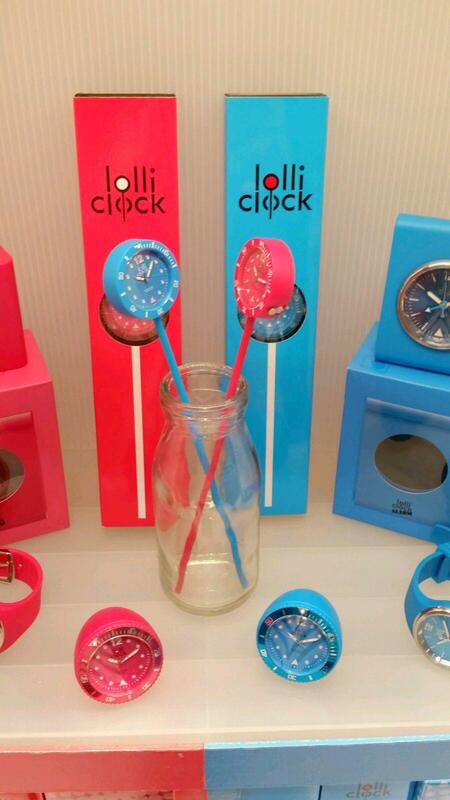 They’re called Lolli Clocks, and they’re the new must-have watches and clocks for 2015. They’re funky. They’re bright. And they’re a great way to keep your brand top of mind. 4. A rockin’ custom tumbler. 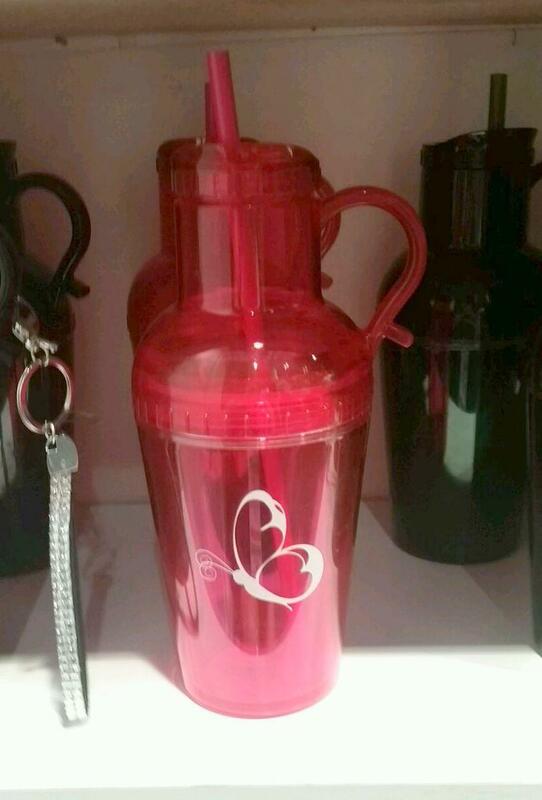 Your customers probably already have a logo drinkware item or two. But they don’t have this. This acrylic cup is a refreshing new take on a tumbler with its unique twist-off top, straw, and handle. Thirsty for more ideas? Click here to browse hundreds of other eye-catching drinkware styles. 5. A soda can topper. Spring Break is just around the corner, and we can already see this promotional product being a huge hit. So, what is it exactly? 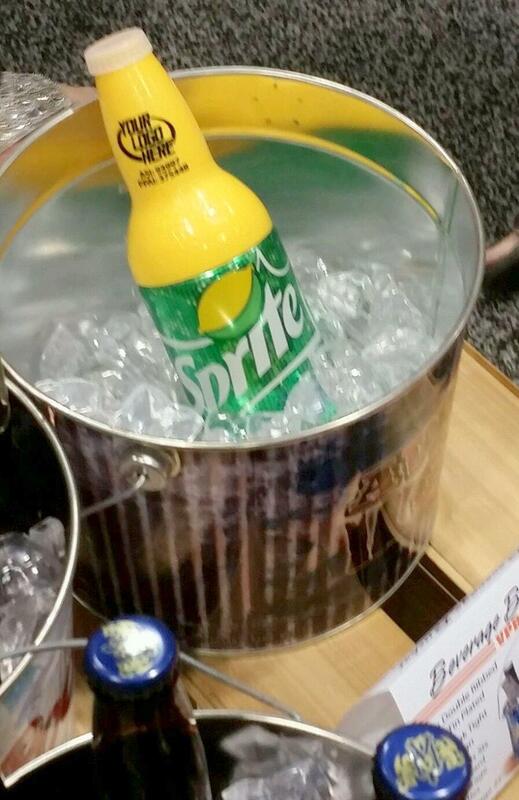 It’s a nifty item that turns soda cans into bottles. Just pop it onto the top of your favorite canned beverage, and voila, you have an instant bottled drink. It makes a fun giveaway for Spring Break promos, company picnics, outdoor events, and more. 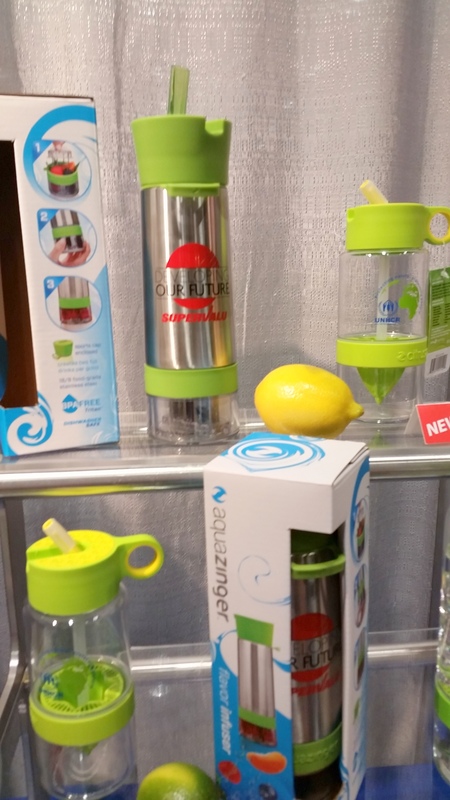 Have you seen S’well water bottles – those super-fashionable, stainless steel, insulated drinking vessels? They’re everywhere right now, and the exciting news is that your brand can jump on the trend. 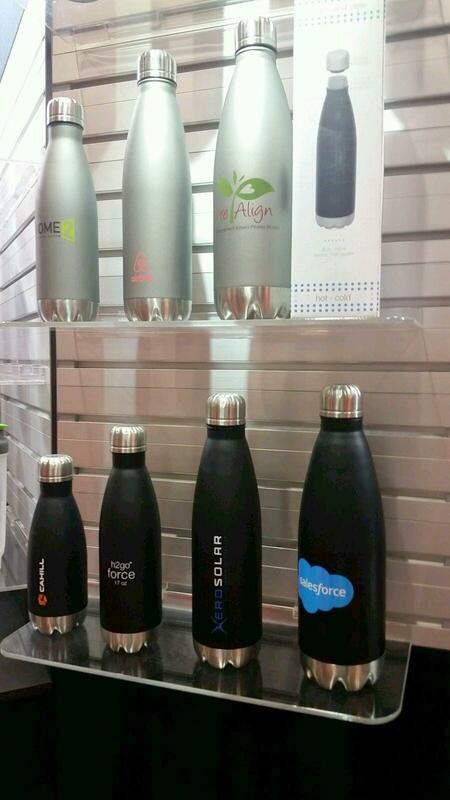 Custom water bottles that are strikingly similar to the popular S’well bottles have hit the promotional products market. If you want drinkware that your customers will love receiving (and using), these bottles are so of-the-moment. 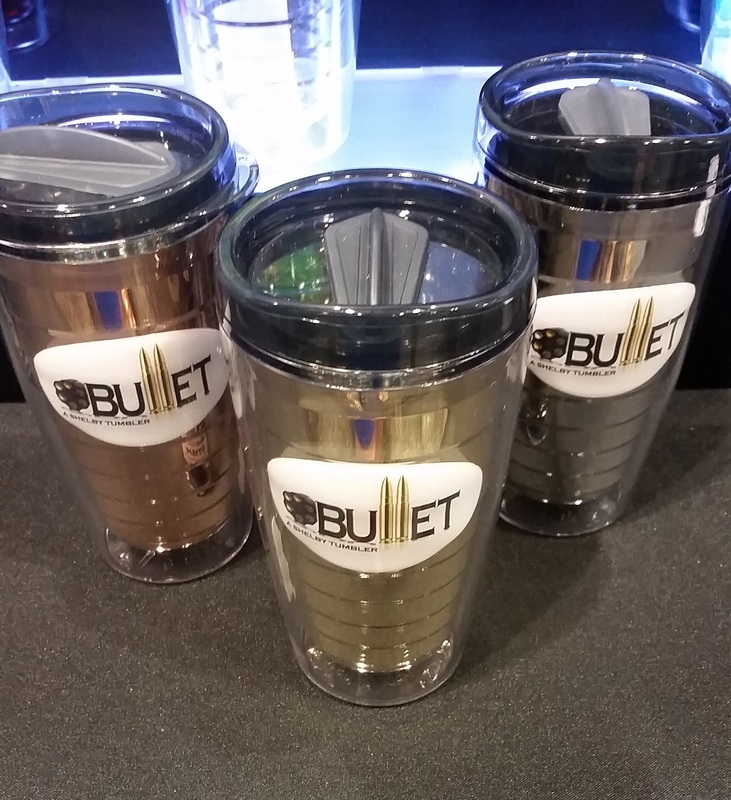 Behold The Bullet: The newest thing in promotional tumblers. Coated metal gives each tumbler a silver, gold, or rose-tone look for an undeniably sleek, high-end promo. Need ideas on how to use tumblers? Click here and here to see how some of our clients have used them in promotional campaigns. We’re all about adding some zing. So, what exactly is this? It’s the 2015 version of a fruit-infuser bottle. It’s fresh, new, and it’s something that your customers will be excited to try out. Here’s how it works: A bottom-mounted grinder allows users to grind ingredients (fruit, mint, cucumbers, and such) while keeping the pulp below and infusing the water with subtle, refreshing flavor. Add your logo, and you have an excellent promo – especially if you’re in the health and fitness market. Check out this video to see the Aqua Zinger in action. 9. A great new tech set. 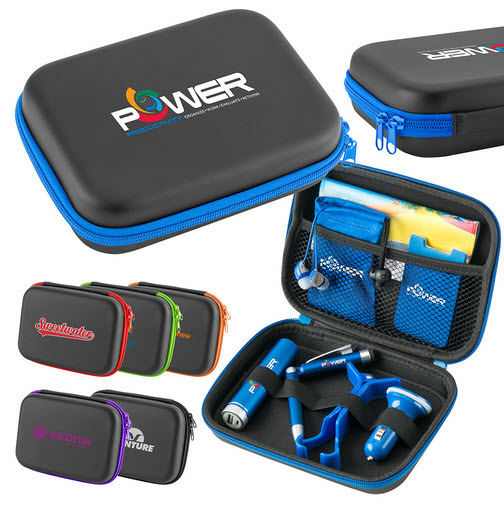 If you want the latest in technology promos, check out this custom tech gift set. It includes all the hottest tech items on the market, and everything is packed inside a custom zippered case with your logo. People will always have a need for tech items – car chargers, earphones, power banks, and more – and this promo has it all. Your company will be adored for giving out something so incredibly useful. 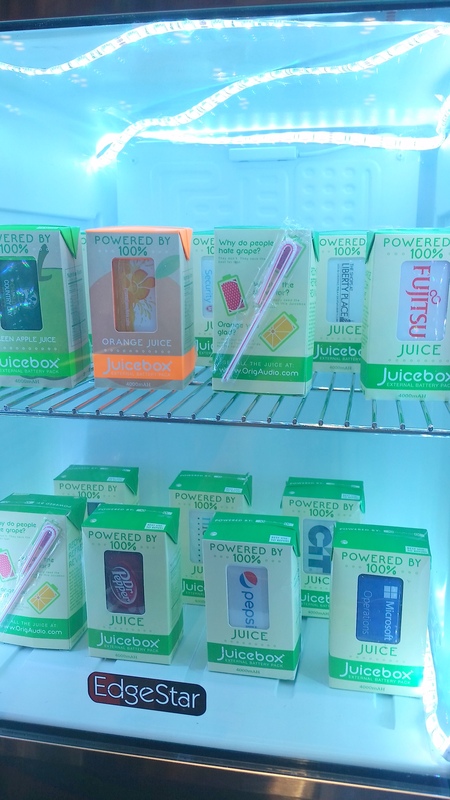 They look like they belong in your kid’s lunch, and that’s what makes Juicebox chargers so unique. This promo is an instant attention-grabber. If you want to get people talking about your brand, this is the way to do it. You’ll also be giving customers something they can use. These chargers are compatible with any device to give an instant boost of power. They even include a novelty straw. How cute is that? Shop for it and other cool tech promos here. 11. A custom charger that looks like lipstick. Here’s a promo that’s pretty and powerful. 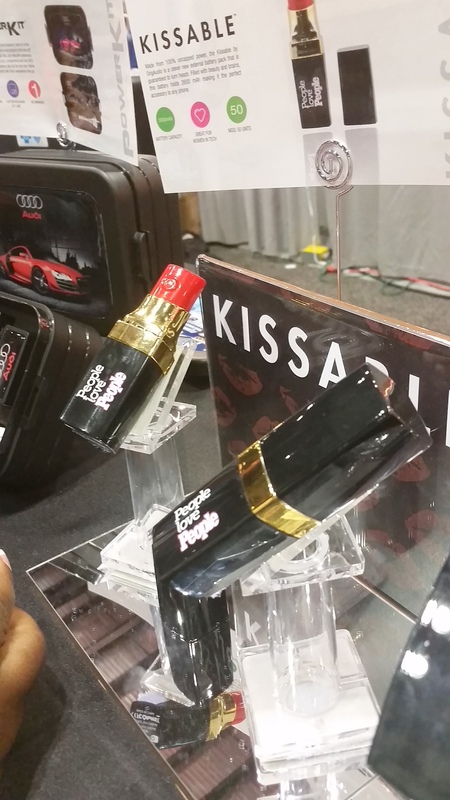 It looks like a tube of lipstick, but it’s actually an external battery pack that holds 2500 mAh. If you’re marketing to women, this promotional product is handy and clever enough to generate some serious buzz for your brand. Order yours here. 12. A logo charger that talks to you. This custom audio car charger was a hit at The ASI Show. When you plug it in, it can be customized with a personal message from your company. A sample at the show played the familiar jingle: “Like a good neighbor, State Farm is there.” If you want to drive home a message or slogan, this charger is a clever way to do it. Here’s where you can browse for more ideas in custom logo chargers. 13. 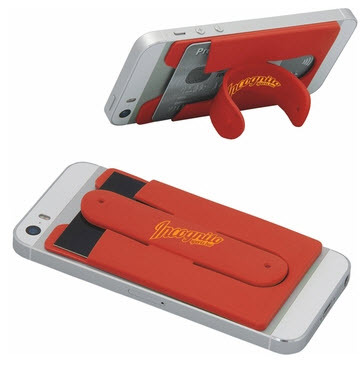 A multi-purpose cell phone accessory. This custom cell phone accessory is a novel little gadget that makes an excellent (and affordable!) tech gift. At under two bucks a piece, this product is super functional. It acts as a wallet, stand, and cord wrap for earbuds. A great way to use it in your marketing? Mail it. It’s lightweight, and people love receiving a surprise in the mail. 14. A custom exercise band. With everyone still riding high on their New Year’s resolutions, a custom exercise band is a timely promotional giveaway. You can add your logo to a product called a Resistor Strip – an exercise band that offers a huge, full-color imprint and the option to be packaged with a 10-minute band workout card. We love this idea for gyms, rec centers, yoga studios, and the like. 15. A sports bottle with a hidden compartment. Speaking of jumping on the fitness trend in the New Year, check out these custom sports bottles. They’re designed with a flip compartment for stashing earbuds or keys during or after a workout. These water bottles are perfect if you’re marketing to gym enthusiasts, runners, or cyclists, or if you’re planning a fitness-related campaign. 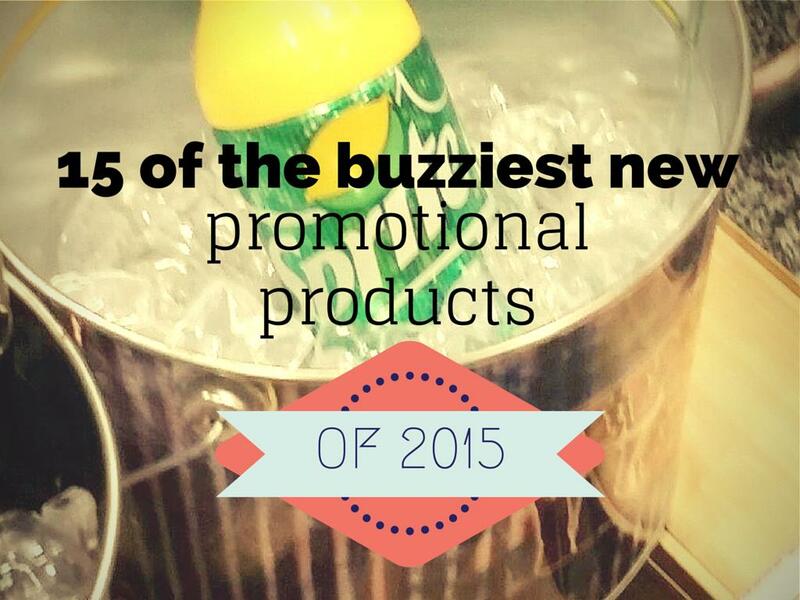 Let’s hear from you: What new promotional product do you want to add to your marketing in 2015?